I thought about it for a moment and it was pretty neat. I saw the new Khan movie with one daughter. I was about to see the original Khan movie with my other daughter. There better not be any more Khan movies. I’ve run out of daughters. As we entered the crowded theater, Catarina noted she was the youngest one there. In fact, she noted I was among the youngest, too. Yes, it seemed the Kodak Center was teeming with more than a thousand sixty-year-olds bound and determined to hear the words of wisdom a single 87-year-old had to offer. Alas, such is the demographic of the fans of the original Star Trek television series. Despite the appearance of an AARP convention, the atmosphere swelled with youthful optimism. If you know anything about The Wrath of Khan, this was delicious irony. The film represents a classic “coming of age” story. Now, usually, when you think of “coming of age,” you think, teenage angst or the awful reality that comes with adulthood. No, this was a “Kick the Can” (to borrow from a famous Twilight Zone episode) “middle age crisis” moment. It’s about how we confront the ultimate – mortality, both our own and others. As we watched the movie, there’s little doubt the people in the audience returned to where they were four decades ago when the picture first was released. Now, some 35 years later, they’re not seeing the film through the wide-eyes of a twenty-something nerd. They’re watching it through the seasoned view of someone reflecting on a past they know contains more years than their future. They share the angst of old age just as the character of Kirk must confront his. And, like Kirk, they seek to smash the metaphorical shackles the aging process brings with it. And then, when the ending credits were abruptly cut short, the star of the show walked onto the stage. The audience cheered. Their hero had arrived. And this wasn’t the obnoxiously blunt hero of the Saturday Night Live “Get a Life” skit. This was a funny guy who didn’t act his age at all. From his appearance (he wore jeans with holes in them) to his deep resonant voice, he exuded an agile spryness that would shame a teenage couch potato. And he was sharp, as sharp as knives. He told a few behind the scenes stories from The Wrath of Khan. For example, Ricardo Montalbán pecs were real. He did not wear a fake chest. He really had those muscles. Shatner said Montalbán could barely walk during the filming. I thought back. I couldn’t remember any scene where Montalbán wasn’t seated. Had I the chance to interview Shatner, I would have asked him what his secret was. How is it that he has been able to remain so active, so alive, so young, after a long lifetime of seemingly non-stop action? I figure many of his baby boomer fans, now face-to-face with the road leaving to the undiscovered country, might seek his counsel. Yes, William Shatner has become a fountain of youth. I thought my question might have been unique. Apparently, it wasn’t. Or maybe it’s just the kind of question publishers like to ask. It turns how he’s got another book coming out this summer. Its title is Live Long and…. His publisher thought it made sense for him to write a book explaining the secret of his octogenarian energy. 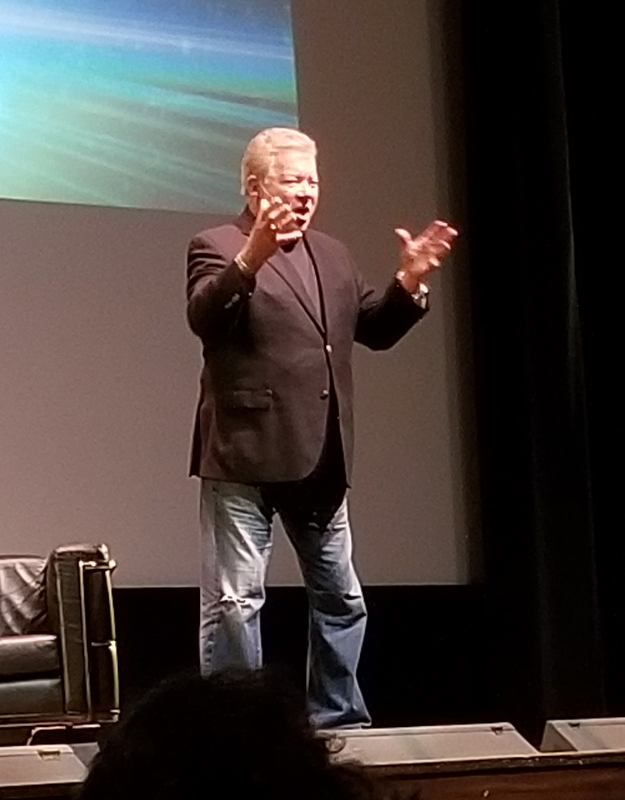 Shatner told the rapt audience he didn’t have the answer, but he wrote the book anyway. That got the intended laugh, but then he explained his reasoning. It made sense. There is no cookie-cutter answer. Every person is different. He wrote the book, therefore, solely from his perspective. What had he done to maintain his dynamic demeanor? You know all those things you think would be really fun to do?